Elder Issues in Indian Country panel. 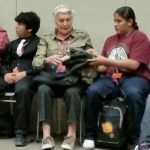 The National Indian Council on Aging (NICOA) was a significant presence at the National Congress of American Indians (NCAI) 73rd Annual Convention and Marketplace, October 9-14, 2016 in Phoenix, AZ. NICOA reached out to NCAI in early January, 2016 to offer partnership to inform tribal leaders, partners and delegates from across the nation about the issues elders face across Indian Country. NICOA is thankful to Denise Desiderio, NCAI Policy & Legislative Director and Robert Holden, NCAI Deputy Director for their support of NICOA’ s advocacy for AI/AN elders. NICOA presented a breakout session titled “Elder Issues in Indian Country” on Wednesday, October 12. 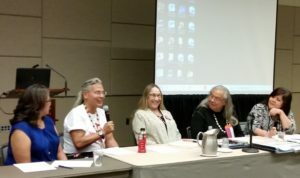 NICOA coordinated a panel of speakers with expertise in aging across Indian Country. The panelists included Aaron Payment, Chairman of the Sault Ste. Marie Tribe of Chippewa Indians; Cynthia LaCounte, Director of American Indian, Alaska Native and Native Hawaiian Programs with the Administration for Community Living; Laurai Atcitty, Director of the Area Agency on Aging with the Inter Tribal Council of Arizona; James DeLaCruz, NICOA Board Chairman; and Randella Bluehouse, NICOA Executive Director. Rebecca Owl Morgan, NICOA Elder Equity Project Coordinator, moderated the panel. An elder and youth share a moment together. This session was attended by approximately 60 interested stakeholders and tribal leaders. The primary focus of this session was around the contentious issue of underfunding for services and supports to elders. Chairman Payment provided a clear example of how his nation makes caring for their tribal elders a priority by supplementing limited federal funding with tribal financial support. This commitment means his tribe is able to provide meaningful services and supports across the tribe’s seven county service area, which is located in Michigan’s eastern Upper Peninsula. The panelists called attention to the growing aging population, with more elders living longer and facing severe health issues and disability access needs. The challenge for tribal leaders is to provide aging and support services to honor elder wishes to age at home and not be institutionalized far from home. The high cost of long term care was discussed, and coordinated community based care and supports was presented as an affordable option to consider. NICOA Executive Director Randella Bluehouse speaks with elders and youth. Another breakout session NICOA helped to coordinate was the “Elder and Youth Roundtable” on Thursday, October 13. This session was dedicated to creating dialogue and creative suggestions for ways that elders and youth can strengthen intergenerational connections. The elders that spoke offered stories about colonization and its deplorable aftermath. They emphasized that native people, young and old, need to lead the way to building successful tribal communities. They stressed the importance of knowing your roots – who you are and where you came from. The historical journey the elders shared was patiently and lovingly received by the youth. The youth in turn offered that communication and respect is key to understanding for both groups. One young woman stated that “youth should take time away from technology and visit with elders”. They also appreciate the positive impact that learning from each other can have on their lives and communities.